The Securities and Exchange Board of India (SEBI), India’s capital market regulator, has announced a decision to tighten the exposure norms for currency derivatives. The Reserve Bank of India backed the decision on Monday night which SEBI asserts could help reign in large scale speculations in the market. A SEBI statement said it is reducing the exposure that brokers and their clients can take on currency derivatives and also doubled their margins on dollar-rupee contracts. The exposure to all currency contracts for a broker has been capped at 15 per cent of their overall exposure or $50 million, whichever is lower. The cap will be six per cent for clients, or $10 million, whichever is lower. SEBI said the decision was taken “in the view of recent turbulent phase of extreme volatility in USD-INR exchange rate”. 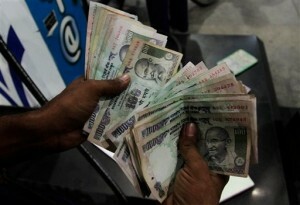 The Indian rupee on Monday dipped to 61.19 against the dollar in early trade at the Interbank Foreign Exchange market, on heavy demand for the American currency amid capital outflows. Currency derivative trading allows traders and investors to take forward views on various currency pairs, including rupee-dollar. Large-scale speculations on their future movements might be adding to the downward pressure on the Indian currency. The new norms will be applicable with effect from July 11. Indian Prime Minister Manmohan Singh will meet industry leaders on July 29 to discuss the rupee fall and measures to correct a wide current account deficit, according to a government statement.